At home or on the road, if the sound quality of your music matters, it's tough to beat the Marshall Kilburn Bluetooth speaker for wire-free listening. For listening on the beach or at the pool, the dunk-proof and rugged JBL Flip 4 and tiny JBL Clip 2 are top choices. 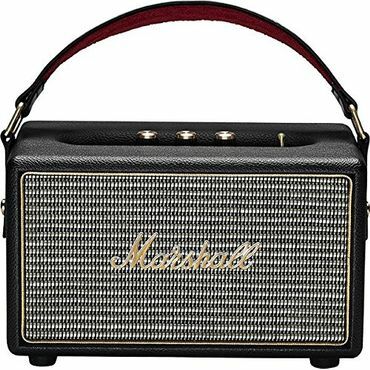 The retro-styled Marshall Kilburn sounds as gorgeous as it looks, making it the favorite Bluetooth speaker of experts and owners. Fashioned exactly like a classic Marshall guitar amp, the compact Kilburn comes complete with a guitar-like leather strap for easy portability. From opera to hip-hop, music sounds balanced and distortion-free – even at top volume – and testers love the satisfyingly solid switches and knobs that make the Kilburn a breeze to use. In the pool, at the beach, in the shower or wherever, the JBL Flip 4 can survive dunkings and drops -- and sound good doing it. Its tough, rubber-bumpered body is completely waterproof, and its water-bottle shape makes it easy to tote. It can double as a speakerphone, is loud enough on its own to fill a backyard with music, and more than 100 Flip 4 (or compatible) speakers can be connected together to really get a party rocking. 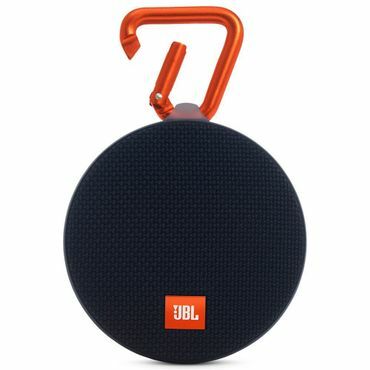 Small enough to hang from a backpack strap, the hockey-puck-sized JBL Clip 2 wins the hearts of experts and owners alike. Rugged and fully waterproof (with an IPX7 rating), the Clip 2 comes with a built-in metal carabiner clip and stowaway headphone cord. Sound quality – and volume – are impressive for such a tiny speaker, and two can be connected together if you want things even louder. The Clip 2 has a speakerphone function, too. For raucous parties or quiet listening on a leisurely afternoon, a Bluetooth speaker lets you enjoy the music stored on a phone or other digital device without being tethered to a set of headphones. These speakers do have their drawbacks, including limited range and less-than-audiophile-quality sound reproduction -- but the fact remains that most of the wireless speakers on the market today are Bluetooth models. There are other options, such as Apple's AirPlay technology, of course, but those have their own drawbacks such as higher cost (though with sometimes better fidelity), less portability, and less compatibility. Bluetooth speakers, on the other hand, are available in a wide range of options -- some with sound quality that, unlike years past, can please all but the hardest-to-please audiophiles. They're compatible with the widest range of devices, including phones, tablets, laptops, music players and more. They also pair directly with devices, so you don't need to connect via a Wi-Fi or another network, as is the case with some other wireless speaker technologies. We selected our best-reviewed portable speakers based on their sound quality, ease of use, design and, if applicable, battery life. We relied chiefly on professional reviews by technology publications. These sources conduct exhaustive hands-on tests of speakers, using a variety of music styles to get a better picture of their overall performance. Then we checked these professional results against user reviews from retail sites to learn about how these wireless speakers hold up over the long term. You could spend anywhere from $400 to $700 on a luxury Bluetooth speaker – but it's really not necessary. For around $250, experts and owners say the retro-styled Marshall Kilburn (Est. $250) looks gorgeous, and sounds incredible. The Kilburn looks exactly like a classic Marshall guitar amp. It's wrapped in the same Tolex textured vinyl (either black or cream), with the traditional cloth speaker grille and famous cursive Marshall logo in gold. The controls are equally old-school: A metal toggle switch flips the speaker on or off, and three smooth-turning knobs adjust the volume and – a fundamental feature now almost extinct from Bluetooth speakers -- the bass and treble. You can use the Kilburn with non-Bluetooth devices for wired listening: It comes with a 3.5mm aux input and a coiled audio cable. It's at least somewhat portable as well, with a wide leather strap makes the bread-loaf-sized, 6.6-pound Kilburn easier to carry from room to room. "The detail work on the system is beautiful," PCMag's Tim Gideon says. TechRadar's Lewis Leong calls it "a piece of audio art." Build-quality is rock-solid, and – thanks to its replaceable battery (another unheard-of treat) – "the Kilburn could be the last portable you need to buy," says Michael Gowan at Tom's Guide. How does it sound? "Fantastic," Gideon says. From opera to bass-thumping hip-hop, it faultlessly handles every genre Gideon throws at it. And the balanced sound won't distort, Gideon says – not even if you crank the volume all the way to 10. And when you do, the Kilburn "simply rocks," TechHive's Theo Nicolakis says. Gowan finds that the Kilburn's sound "easily fills a large room, or a small house." Leong calls the Kilburn "near perfect," and owners agree: It earns overwhelmingly rave reviews at Amazon, Best Buy and Crutchfield. If price is no object, check out the Bowers & Wilkins Zeppelin Wireless (Est. $700), the champion of luxury Bluetooth speakers. The 26-inch-wide, sleek, cloth-covered cigar (available in black or white) is meant to adorn a tabletop as a work of modern art. It plays music wirelessly via Apple AirPlay and Spotify Connect as well as Bluetooth – including the highest quality aptX codec -- and there's a 3.5mm aux jack for wired listening. "But most of all I love that sound," says Dave James at TechRadar. "Mind-blowing," Trusted Reviews' Danny Phillips calls it. At Wirecutter, "Our listening panel awarded the Bowers & Wilkins Zeppelin Wireless an almost perfect score." Even the hard-to-impress audiophiles at What Hi-Fi? approve: "The latest Zeppelin is everything we want from a Bluetooth speaker." The only problem is that price tag – and perhaps a spotty AirPlay connection. One out of seven Amazon owners flunks the Zeppelin Wireless with a lowly 1-star rating, mostly because AirPlay won't work properly. At first glance, the Peachtree Audio Deepblue3 (Est. $400) looks like a good Zeppelin alternative. Its predecessor, the Deepblue2, wowed even the pickiest critics with its jaw-dropping sound. With the new Deepblue3, Peachtree Audio says it has simply extended the range and reliability of its Bluetooth connection. That Bluetooth connection infuriated some Deepblue2 owners. Nearly one in five Amazon reviewers downgrades the Deepblue2 to just 1 or 2 stars, almost always complaining about the glitchy Bluetooth. With no expert reviews of the Deepblue3 yet (and very few owner reviews), it remains to be seen if Peachtree Audio has fixed the problem. That said, initial owner reviews seem promising, making this an option to consider, especially if feedback begins to accumulate. Rough, tough and waterproof, the JBL Flip 4 (Est. $85) takes a beating and sounds much more expensive than it actually is – and it's the one Bluetooth speaker reviews recommend more than any other. "The new sub-$100 speaker king," Tom's Guide declares The Flip 4 also wins awards from CNET and TechHive, is named a best buy by Consumer Reports, and is a customer favorite at Amazon, Best Buy and Crutchfield. About the size of a water bottle, the cloth-covered Flip 4's rubber bumpers protect it from getting knocked around, and it'll survive being submerged in 3 feet of water for 30 minutes. It comes in your choice of color (black, white, gray, blue, teal or red), with a shoestring loop at one end to wrap around your wrist, hang over the showerhead, etc. Its strong Bluetooth connection easily ranges more than 50 feet indoors in Tom's Guide's test. The Flip 4 can last up to 12 hours on a charge, connect to two Bluetooth devices simultaneously, function as a speakerphone and Siri or Google assistant, and fill an average room or suburban backyard with big, open sound -- "a quality of sound that you wouldn't expect for its size or price tag," TechHive says. It's JBL Connect+ enabled, meaning You can connect together more than 100 Flip 4 (or other Connect+) speakers for even louder (or multi-room) sound. Even solo, Trusted Reviews' Andrew Williams says, the Flip 4 is the life of the pool party: "It's a fun speaker with plenty of volume available." Runner-up UE Wonderboom (Est. $70) looks like a squattier Flip 4. It's likewise fabric-covered and waterproof, with rubber bumpers and a little elastic carrying loop (which is very short and "unhelpful," TechRadar's Lewis Leong says). Like the Flip 4, the Wonderboom can connect to two Bluetooth devices simultaneously and works with Siri or Google Assistant. Its max battery life (10 hours) is a bit shorter than the Flip 4's, but the Wonderboom advertises a super-long Bluetooth range (100 feet). It can't take phone calls, though. The Wonderboom can play "ridiculously loud" – high praise from Trusted Reviews' Alistair Stevenson – with bass that Leong describes as "good, but not class-leading." Williams at Trusted Reviews agrees that the Flip 4's bass depth and power outperform the Wonderboom's "by a significant margin … The JBL Flip 4 is a better party speaker than the Wonderboom, unless your idea of a party is listening to some Nick Drake as your guests nibble cheese and crackers." But CNET's David Carnoy prefers the bass – and the overall sound – of the Wonderboom. Owners are just as happy with it as they are with the Flip 4: The Wonderboom averages 4.5 stars or better in hundreds of reviews at Amazon, Best Buy and Crutchfield. If price is no object, the Bose SoundLink Revolve+ (Est. $300) wows experts and owners. "It's probably the best-sounding speaker of its size I've ever heard," says David Carnoy at CNET. It wins awards at Trusted Reviews and TechHive, too, and owners at Amazon, Best Buy and Crutchfield rave about it. The Revolve+ looks like a lantern, with a saltshaker-shaped body and a carrying handle. Its aluminum body (available in black or light gray) has rubberized bumpers like the JBL Flip 4 – but the Revolve+ is only splashproof, not fully waterproof. Like the Flip4, the Revolve+ offers long battery life (16 hours), works as a speakerphone and Siri or Google assistant, and can play music from non-Bluetooth devices (via USB and 35mm aux inputs). So far, so similar. "What separates the Bose from its competitors is the ability play a little louder, put out more bass without distorting and sound a little more natural with decent detail," Carnoy says. "Is it worth three times more? Maybe not, but it's clearly a better-sounding speaker." A smaller, less expensive version, the Bose SoundLink Revolve (Est. $200), delivers less bass, less volume and shorter battery life (12 hours). "It, too, is an excellent speaker for its size," Carnoy says, "but if I personally was deciding between the two, there is enough of difference in sound quality (and that integrated handle is nice) that I'd spend the extra dough on the Revolve Plus." 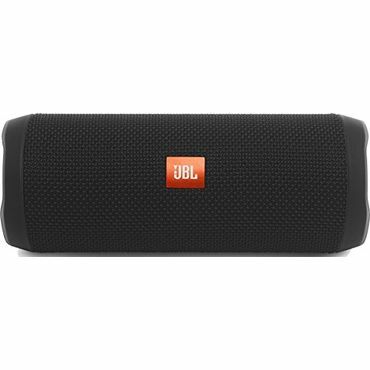 If you'd prefer something smaller -- and cheaper – the JBL Clip 2 (Est. $40) sounds surprisingly good for its tiny size, reviews say. No bigger than a hockey puck, the Clip 2 comes with a built-in metal carabiner clip and stowaway headphone cord (handy if you want a wired connection, instead of wireless). Like its big brother, the JBL Flip 4, the Clip 2's rugged fabric-and-rubber body comes in black, gray, or bright colors, and it's waterproof under 3 feet of water for 30 minutes. The inexpensive Clip 2 even has a speakerphone function. Battery life is about 8 hours. Sound-wise, the Clip 2 delivers "impressive treble, midrange and bass for a small speaker," Tom's Guide says. PCMag agrees that "the JBL Clip 2 strikes just the right balance. It gets quite loud, boasts a waterproof design, and there's no need to worry about losing any of its built-in accessories." Both name it an Editors' Choice tiny Bluetooth speaker. Wirecutter says, "if you need something small enough to hang from a backpack strap, the Clip 2 is a nice choice." Owners are crazy about it: It averages 4.5 stars or better over thousands of reviews at Amazon, Best Buy and Crutchfield. Wirecutter conducts outstanding head-to-head tests of wireless speakers, subjecting 11 home Bluetooth speakers and more than 100 portable Bluetooth speakers to a listening panel, battery life tests and (for the outdoor Bluetooth speakers) abuse tests. Reviews by other expert sources -- CNET, PCMag, Tom's Guide, What Hi-Fi?, TechRadar, Trusted Reviews, TechHive, Hi-Fi+ and InnerFidelity -- are just as thorough, although not head-to-head. Consumer Reports tests wireless speakers, rating their sound quality, ease of use and versatility, and ranking them from best to worst, but it doesn't provide many details, and Bluetooth speakers are mixed in with other wireless technologies. Owner reviews at Amazon, Best Buy and Crutchfield reveal how well various Bluetooth speakers work in real-world use.